Republicans are about to get a big win on taxes. But at what cost? WASHINGTON — Republicans are on the cusp of their biggest legislative victory of the Trump Era, and they will have plenty to cheer about when the final bill clears the House and the Senate, as it's expected to do in the next 24 to 48 hours. They delivered on a key promise and conservative goal (cutting taxes). They kept their party united (which wasn't the case with health care). And they will have something to take back to voters for next year's midterm elections (the tax cuts, the repeal to the health care law's individual mandate). But the victory has comes at a considerable political cost for President Trump and congressional Republicans — and we're not talking only about the midterms. During the '16 campaign, as well as in his first months in office, Trump called for raising taxes on the wealthy; he talked about giving power back to the people; and he promised that he wouldn't benefit under the tax bill. In fact, while most Americans would get a tax break in the legislation's first year, more than 80 percent of the bill's benefits would go to the Top 1 percent of taxpayers by 2027, according to the nonpartisan Tax Policy Center. And yes, the legislation's provision to allow the super-wealthy to pass up to $22 million tax-free to their heirs (up from the current $11 million) would benefit Trump and his family. Ask yourself: Does this legislation help or hurt Trump in Michigan, Pennsylvania and Wisconsin? One of the common refrains after their defeat in 2016 has been: What's the Democrats' economic message? Well, this bill gives it to them on a silver platter. Democrats, in 2018 and 2020, will likely campaign on putting the middle class before the wealthy and corporations (under this bill, the corporate tax cuts are permanent, while the ones for individuals are temporary). They will blame health care premium increases on the repeal of the individual mandate. And above all, they will say that Donald Trump doesn't deserve a tax break, which he gets under the legislation. 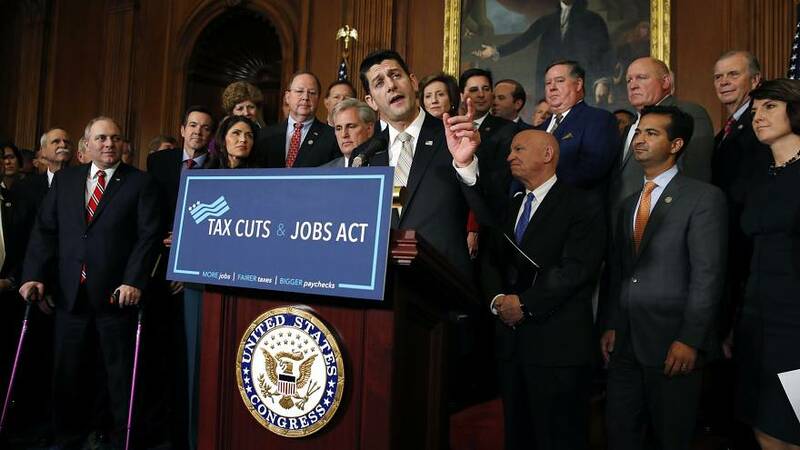 According to a Monmouth poll released yesterday, 47 percent of Americans disapprove of the House and Senate tax plans, while just 26 percent approve (-21). And a new CNN poll out this morning shows 55 percent of Americans opposing the GOP's tax effort, versus 33 percent supporting it (-22). Indeed, FiveThirtyEight points out that this legislation is the most unpopular tax bill — either RAISING taxes or cutting them — dating back to 1981. Remember when Republicans howled at spending during the Obama Era? Remember when they insisted that all government spending should be paid for? Well, this tax legislation has a price tag of about $1.5 trillion, and it isn't fully paid for (even when you factor in assumed economic growth under the most favorable of analyses). "White House lawyers are expected to meet with special counsel Robert S. Mueller III's office late this week seeking good news: that his sprawling investigation's focus on President Trump will soon end and their client will be cleared," the Washington Post writes. "But people familiar with the probe say that such assurances are unlikely and that the meeting could trigger a new, more contentious phase between the special counsel and a frustrated president, according to administration officials and advisers close to Trump." "People with knowledge of the investigation said it could last at least another year — pointing to ongoing cooperation from witnesses such as former Trump campaign adviser George Papadopoulos and former national security adviser Michael Flynn, as well as a possible trial of two former Trump campaign officials. The special counsel's office has continued to request new documents related to the campaign, and members of Mueller's team have told others they expect to be working through much of 2018, at a minimum." In a separate piece, the Washington Post writes, "The Senate Intelligence Committee is looking at the presidential campaign of the Green Party's Jill Stein for potential 'collusion with the Russians,' a sign that the panel's probe is far from over, even as allegations swirl that the House Intelligence Committee's investigation is racing to a close." Stein released a statement last night saying she would cooperate with the Senate Intel Committee. "Our campaign has observed the highest standards of transparency and integrity in our interactions with foreign nationals as well as Americans. Our communications with Russian individuals regarding an invitation to speak on international relations at the RT 10th anniversary media conference will confirm what we stated publicly at that time and since: that we did not accept any payment or even reimbursement for the trip, and that we made the trip with the goal of reaching an international audience and Russian officials with a message of Middle East peace, diplomacy, and cooperation against the urgent threat of climate change, consistent with long-standing Green principles and policies." And here's NBC's Ken Dilanian, Julia Ainsley and Carol Lee: "In the weeks after he became the Republican nominee on July 19, 2016, Donald Trump was warned that foreign adversaries, including Russia, would probably try to spy on and infiltrate his campaign, according to multiple government officials familiar with the matter." More: "The warning came in the form of a high-level counterintelligence briefing by senior FBI officials, the officials said. A similar briefing was given to Hillary Clinton, they added. They said the briefings, which are commonly provided to presidential nominees, were designed to educate the candidates and their top aides about potential threats from foreign spies. The candidates were urged to alert the FBI about any suspicious overtures to their campaigns, the officials said."